Monday, Aug. 31 was National Trail Mix Day. I don’t know why. It just was. I feel I should have something poetic to say, such as, how this is so representative of the condition of our world, but the truth is, I thought it was funny. Who has this job? This job of naming days national this and that? Did he or she run out of ideas? Is that how we got to National Trail Mix Day? That’s not to say it’s not a worthy subject. Certainly my generation has witnessed the evolution of trail mix. I’ve only now stopped to consider how insidious trail mix actually is. It’s virtually everywhere. Every gas station. Every quick mart. In the 1970s, when it was still kind of a rare thing, we called it gorp. I don’t know that you could purchase it anywhere, other than through food co-ops. At least not in the rural West. Raisins, peanuts, and chocolate M&Ms. Some wisecracker might have called it hippie food, too, but to us it was just gorp. As a young wife I made it by the bucketful for holiday presents and hunting trips. We bought ingredients in the bulk section of our local IGA supermarket, never giving thought to whether it was grown using organic methods or might be genetically modified. We trusted the quality of the food we purchased, which seems like such a luxury now. Then came Chex mix. Chex mix, if you don’t know, is a combination of several types of Chex cereal, pretzels, and pecans tossed in a salty, vaguely sweet mixture then toasted in the oven. In some culinary circles it is referred to as Crack. After that all manner of things began to appear in gorp–the occasional stick pretzel, for one. Then the banana chips. The yogurt chips. You name it. It was all over. Gorp fell away from the vernacular, and we were left with the ubiquitous name trail mix. Trail mix now can include any combination of dried fruits, nuts, seeds, and even vegetables. (We bought one scrumptious all-veggie mix at a farmer’s market this summer. We immediately went home and tried to duplicate it; I’ll share the recipe when I get it right.) We’re all about portable food in our culture, but this is one point where everyone wins—trail mix is usually just as cheap as a candy bar, and discerning consumers have learned that such a fuel combination keeps blood sugar at sustained levels. It’s quick food and good food. Few other snacks are as balanced in protein, wholesome fat, and fiber, while providing a boost of essential vitamins and minerals. In Blue Moon Vegan, the yummiest dessert by far to me is Elegant Dessert Gorp. 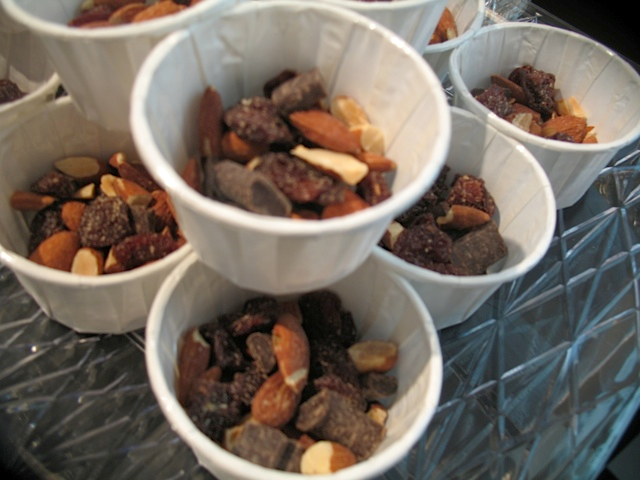 One part each orange-juice sweetened dried cherries , Toasted Tamari Almonds, and Happy Life Chocolate Chunks. All organic, of course. The mix is so rich you can’t eat much, but the memory hangs, makes you smile and nod at odd moments. Especially if the almonds are toasted darkly enough. Next time you buy trail mix bars at the convenience store, I hope you think about its humble beginnings, how we once lived in a world where trail mix did not exist. How it doesn’t really come from the days of Westward Ho! but from all the rural west housewives of the 1970s and ’80s trying to advance their kitchen craft and bring a bit of the exotic to the snack menu.